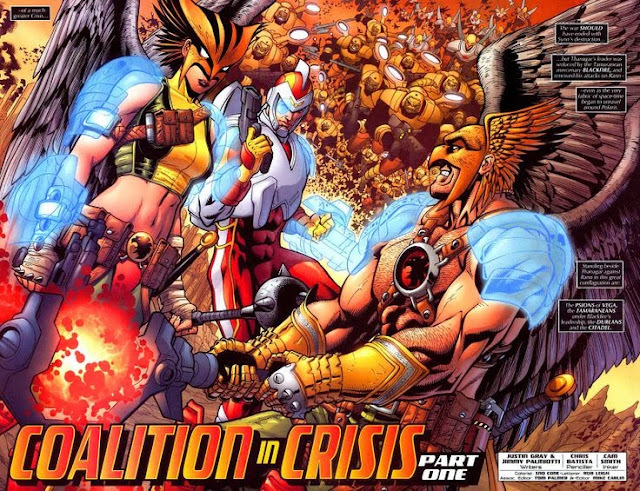 It took a while for Hawkman to tie into the stunning efforts of high-profile mini-series Rann-Thanagar War, but when the three-part Coalition In Crisis finally hit, artist Chris Batista really went to town, delivering work that trumped anything he'd previously done on JLA. Just click to enlarge and see what I mean! More people need to rewind and check out writers Justin Gray and Jimmy Palmiotti's tag-team run on The Winged Wonder - as it was going MAJOR places before DC canned it. Sure traditionalists didn't like Adam Strange's new hi-tech look, but for this reader, it finally put the sci-fi back in a DC U littered with shiny rings, and reminded me of one of the best Hawkman arcs ever, The Shadow War. Growing up, for me Adam Strange and Hawkman and Hawkgirl were seemingly from the same area, their adventures seemed so closely aligned. One major advantage of these outer-space adventures is that the writer isn't restricted by humans and can concentrate on aliens full-time. Just look at the angle Hawkman is holding that weapon of his; positively scandalised, I am. Thanks Karl. I still think one of the best comics I read as a kid was a DC Comics Presents issue where the Hawks and Supes fought an space invasion. Three folk against all this spaceships was epic and like you say seeing them not hold back was the best part of it. While Hawkman's mace looks just as great high-tech as it does liw-tech, if Hawkgirl wore a proper top it might not glow so much. i loved the Adam Strange Planet Heist saga as well as the Rann-Thanagar War that followed. since then Adam Strange has become one of my favorite DC characters. His space suite redesign was also great. Awesome clip art you have up there. Thanks Dave! I love anything to do with jetpacks, so I first met Strange in his miniseries done by the Kubert brothers. When both the miniseries you mentioned came out, I thought 'wow DC's finally setting Adam up for the big leagues.' But even though he had a spot in Wednesday Comics sadly afterwards he sank again. I even chose Planet Heist as my pick for a website crossover IADW took part in arranged by Shag at Firestorm fan. It's one of my all time favourite comics. My first Adam Strange reading was from a couple of Swamp thing issues written by Alan Moore. Great stuff!